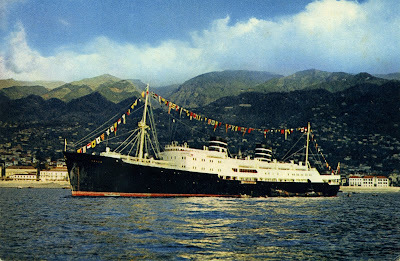 On 31 December 1956 the handsome sister ships VERA CRUZ and SANTA MARIA of Companhia Colonial de Navegação, met in the port of Funchal. 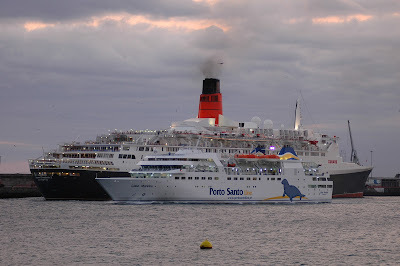 Both ships were doing their usual liner voyages: VERA CRUZ arrived from the Brazilian ports of Santos, Rio de Janeiro, Salvador and Recife, with a call at Cape Verde (São Vicente) and sailed for Lisbon, while SANTA MARIA made a scheduled call on her regular transatlantic services , having arrived from Lisbon and Vigo, for Tenerife and the Central America ports of La Guaira, Curaçao, Kingston, Havana and Port Everglades. Also in port was the Portuguese Navy training ship SAGRES the oldest of the three ships in the picture and the lucky one as she still exists under the original name RICKMER RICMERS, preserved as a museum ship in Hamburg. Nostalgic view of Funchal Bay on 13 June 1933 with two four-funneled British passenger liners at anchor: the famous Cunard liner MAURETANIA in white cruising livery and Union-Castle Mail Steam Navigation Company's ARUNDEL CASTLE on her normal call within the Southampton - Cape mal run. 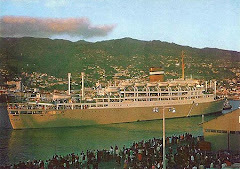 RMS CAPETOWN CASTLE arriving at Funchal in the 1960s. 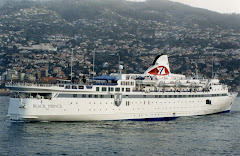 The distinctive livery of Saga Cruises suits very well to their newest ship, the SAGA PEARL II ex-ASTOR of 1981 photographed on 30 December 2010 alongside Pontinha pier, at Funchal, Madeira Island. NORWEGIAN JADE ex-PRIDE OF HAWAII (92.250 GT/built 2006) leaving Funchal, Madeira Island on 29 December 2010. 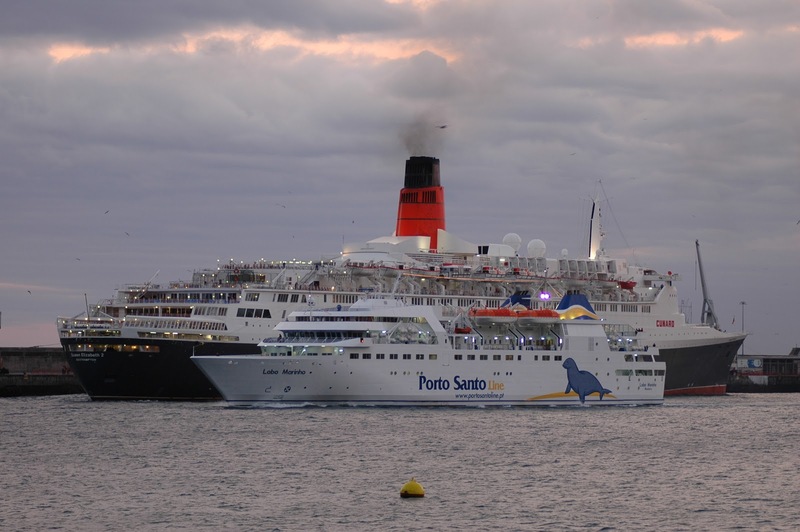 Portuguese passenger ships used to operate cruises from Lisbon to Funchal, Madeira Island for the New Year's eve famous fireworks display. Empresa Insulana de Navegação started those cruises with their passenger and mail ship LIMA in the 1930s while in 1948 Companhia Colonial de Navegação also did begin cruising to Madeira with their handsome SERPA PINTO. Companhia Nacional de Navegação also operated some cruises to Madeira, namely using their flagship NYASSA in the late forties and early fifties. On 30 December 1955 the liner VERA CRUZ departed from Lisbon for Funchal on one of such cruises as advertised in this page. 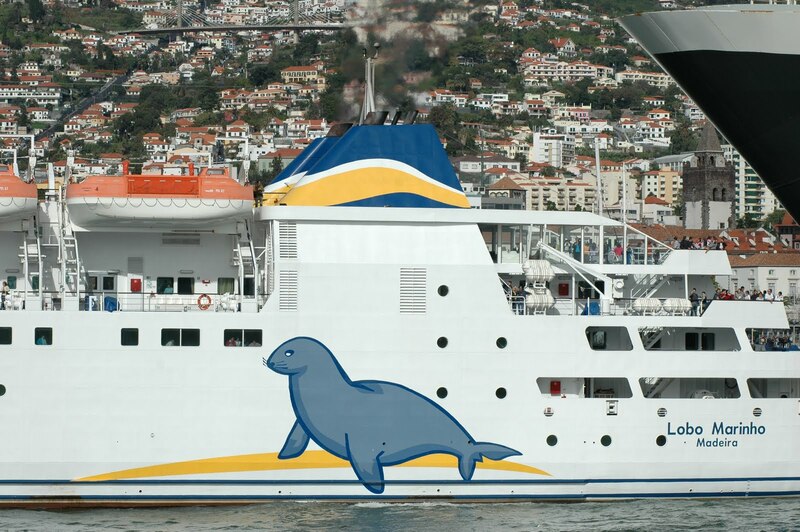 She did a call in Tangiers on her return to Lisbon. 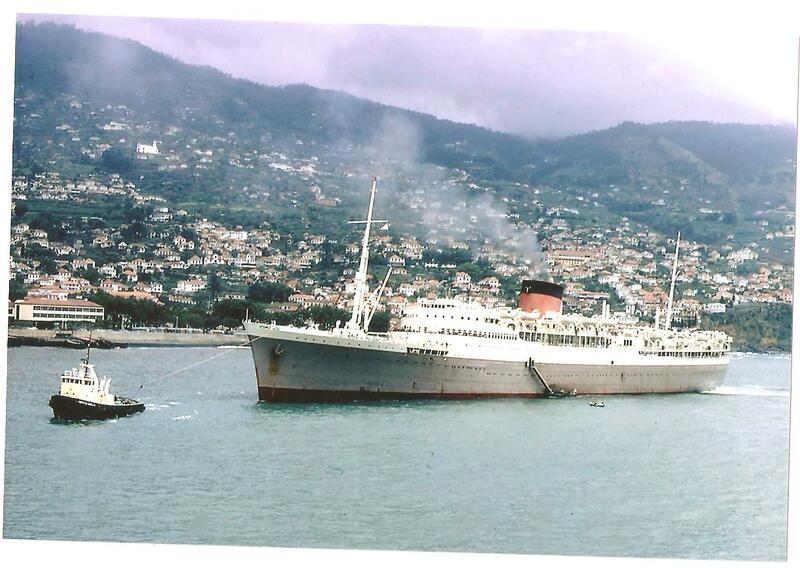 Unfortunately the final cruise of traditional Portuguese passenger ships to Madeira for the 31st December and New Year was performed by INFANTE DOM HENRIQUE for the 1975/76 New Year, and this was also the final voyage of INFANTE under CTM ownership. On her return to isbon on 3 January 1976 she was laid up and offered for sale. 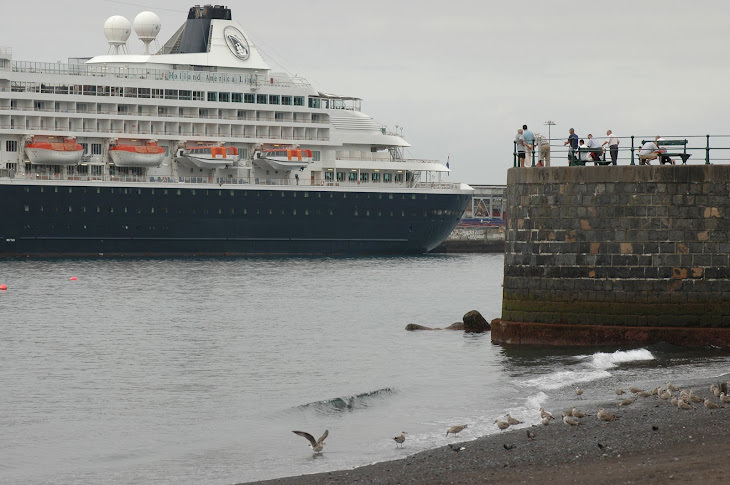 Two of my favourite ships, the legendary QUEEN ELIZABETH 2 of 1969 and the handsome Portuguese cruise ferry LOBO MARINHO of 2003 photographed early in the morning in the port of Funchal, Madeira Island, on 31 December 2006. 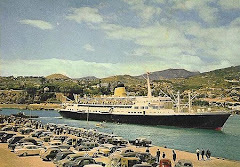 The beautiful Norwegian cruise ship METEOR berthed at Funchal harbour back in 8 April 1965. 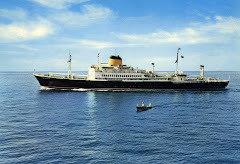 A very nostalgic image sent to me by Mr. Anders de Lange, a former crew member of the ship who actually took the photo. Copyright photograph from the Luís Miguel Correia collection / Photo by Anders de Lange. 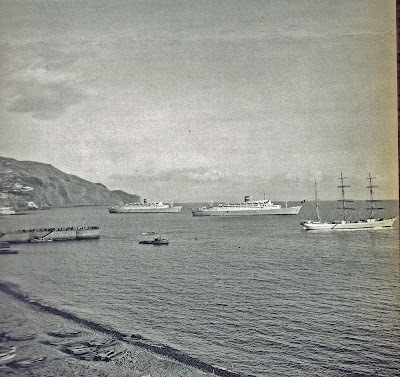 The Portuguese passenger liner VERA CRUZ (1952-1973) at anchor in the bay of Funchal, Madeira Island, being serviced by a small fleet of local tenders and small boats selling goods to the passengers in transit. A magnificent side view of the VERA CRUZ, and a credit to her designers in 1949, as she showed a very modern and elegant profile. 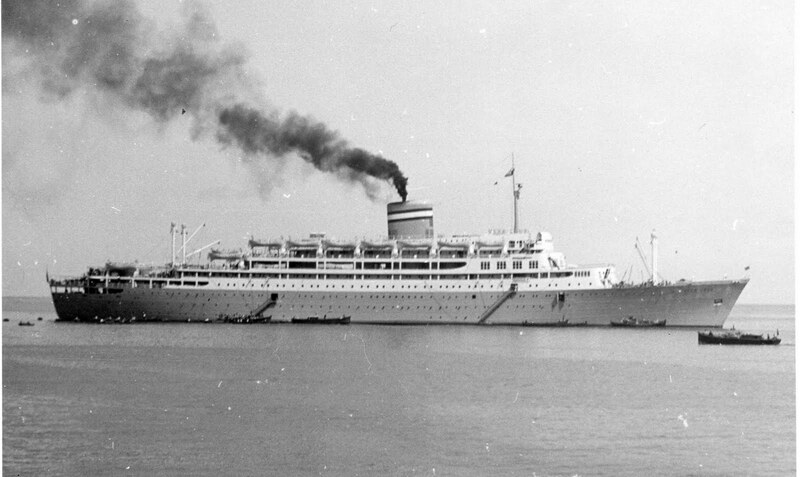 The VERA CRUZ operated on the Lisbon - Brazil liner service from March 1952 until May 1961. She was also used on long cruises as well as liner voyages to Central America and Port Everglades, and in her post-1961 period, on voyages to Africa, mostly as a trooper. 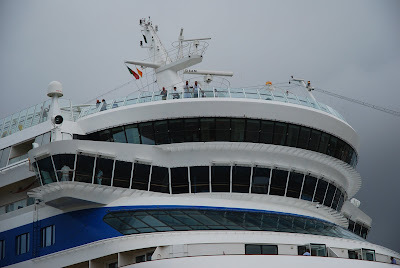 More images and information on this magnificent ship here. 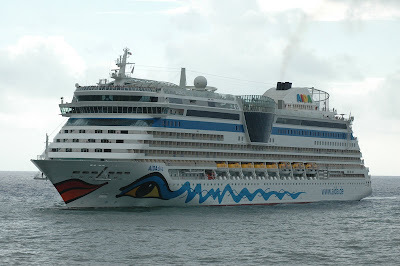 Naviera Armas cruise ferry VOLCAN DE TIJARAFE leaving Funchal, Madeira Island, on her regular Saturday voyages to Portimão, Algarve. 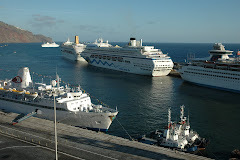 Photos taken in Funchal on 26 June 2010. The VOLCAN makes a regular trip from Las Palmas, Tenerife, and Funchal to Portimão and back, calling at Funchal on the return leg on Mondays. 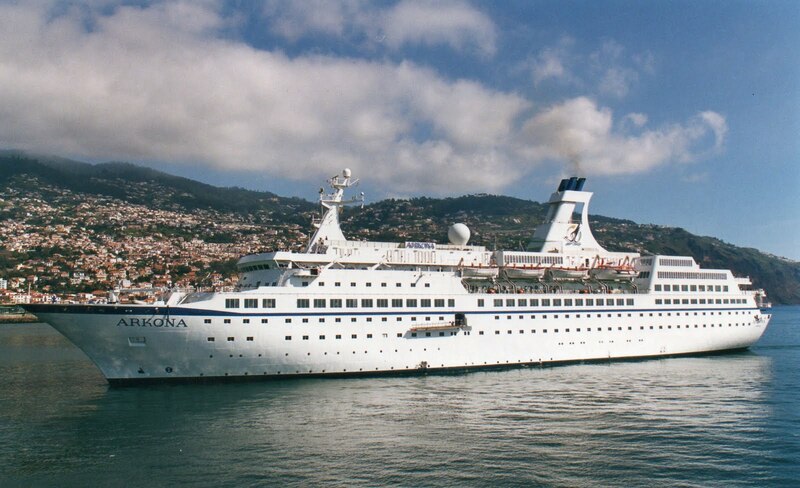 Cruise ship ARKONA arriving Funchal on 5 February 2002. 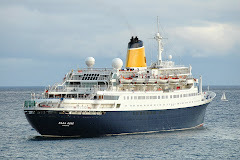 She is still in service as Saga Cruises SAGA PEARL II. 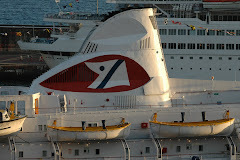 In the photo, the BOUDICCA about to berth in Funchal, 31 December 2009. 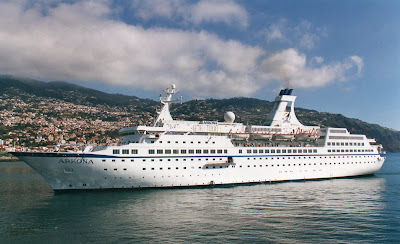 The brand new Greek cruise ship OLYMPIA VOYAGER anchored off Funchal, Madeira Island on a cruise on 23 April 2003. 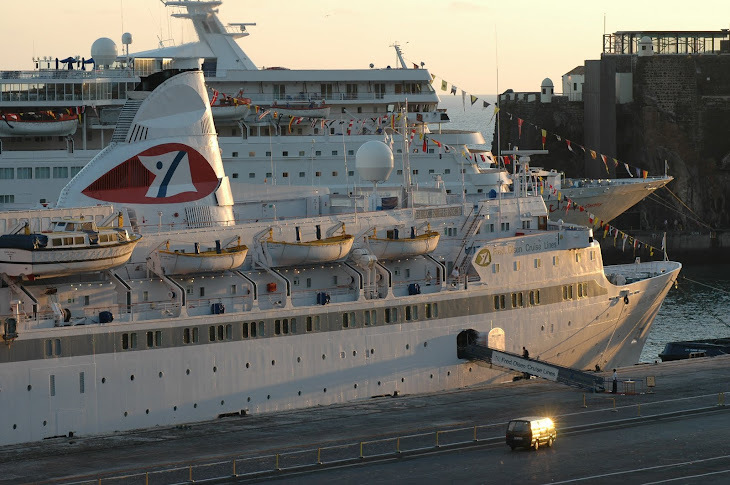 NORWEGIAN CROWN berthed in Funchal, Madeira, on 26 April 2003 already with white hull ready to be transferred to NCL prior to her salo to Fred. Olsen. 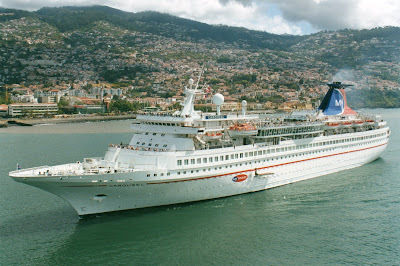 Cruise ship CAROUSSEL ex-NORDIC PRINCE arriving Funchal, Madeira Island, on 24 April 2003 while cruising regularly on 7day cruises out of the Canary isles. 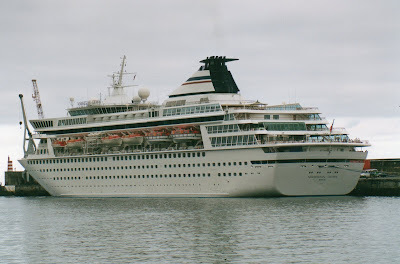 She is still in service under Louis Cruises ownership. Copypright photograph by Luís Miguel Correia. SAGA RUBY photographed at anchor off Funchal waiting for the New Year's fireworks on 31 December 2009. She looks better than ever in her smart Saga livery. 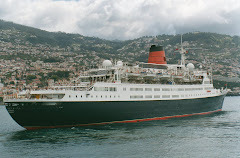 CARONIA arriving at Funchal on 23 April 2003 on her final period under Cunard colours before her sale to SAGA. 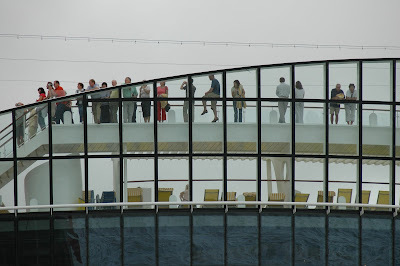 Photographs taken from the head of the Pontinha pier in late morning light. 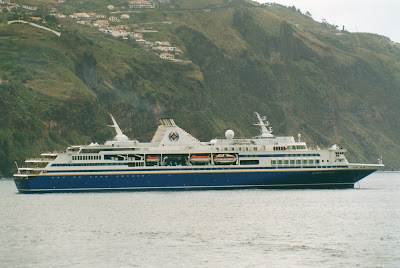 Cruise ferry LOBO MARINHO arriving Funchal from Porto Santo on 31 December 2005. 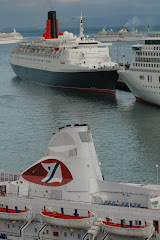 The bow of QUEEN ELIZABETH 2 can be seen on the right corner. She is now operating her final cruise for Fred. 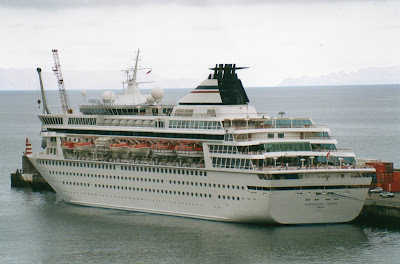 Olsen and will start a new career in Venezuela waters in November under the new name OLA ESMERALDA. 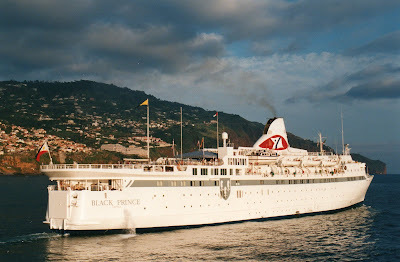 Photograph of the BLACK PRINCE leaving Funchal on 21 December 1988 by José Miguel Malho, LMC collection. 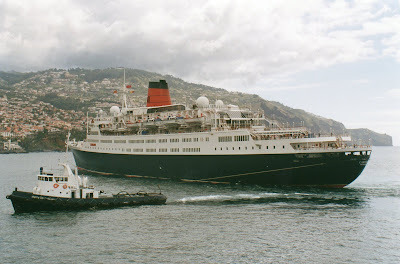 Another classic ship portrait by Vitor Rodrigues Faria with the Greek cruise steamer ROYAL ODYSSEY leaving Funchal, Madeira, on 8 December 1985, while doing her transatlantic positioning voyage westbound. 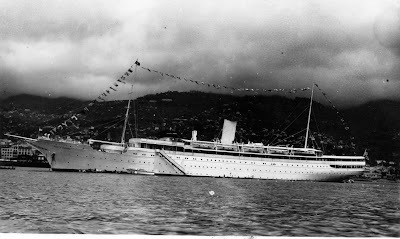 Soviet passenger liner MIKHAIL LERMONTOV arriving at Funchal, Madeira Island, late in her short career, already with the hull in white. 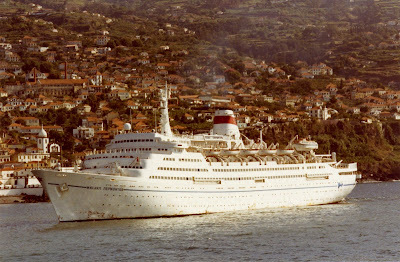 Soviet ships were very popular in Madeira waters in the 1970s and 1980s. The beautiful Portuguese passenger liner SANTA MARIA (1953-1973) photographed alongside the head of Pontinha Pier while doing a New Year's cruise from Lisbon. 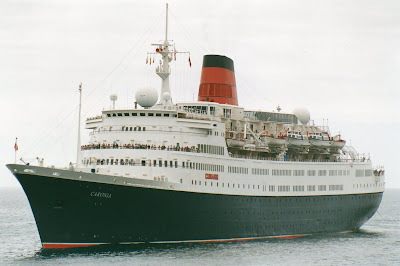 Her distinctive bow and livery were unmistakable and very modern as a post war design developed in 1949 for Companhia Colonial de Navegação Lisbon - South America service. Photograph kindly sent by my dear friend Fernando Lemos Gomes. 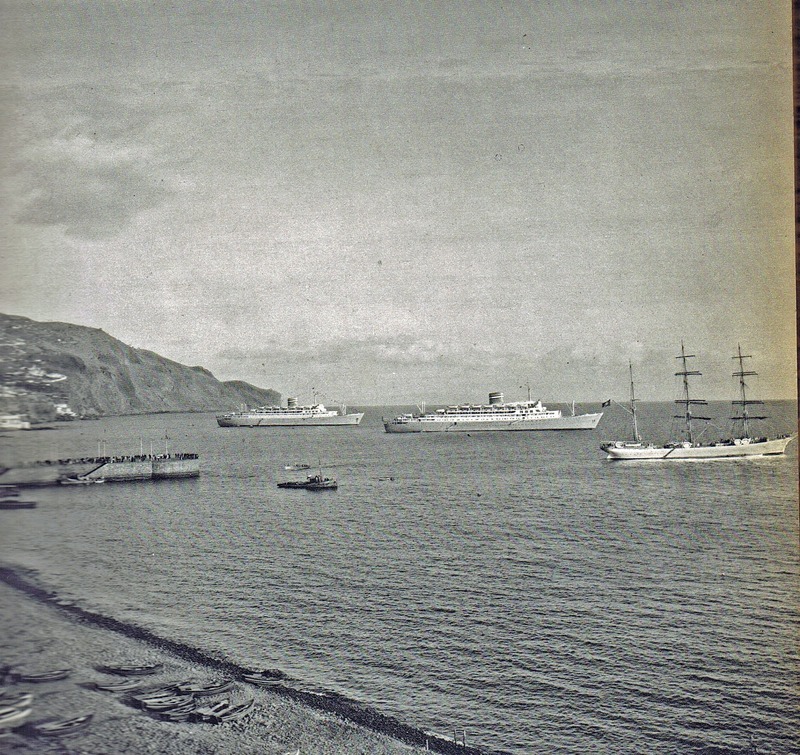 Peaceful view of Funchal waterfront in the early 1950s showing VENUS anchored in the bay. 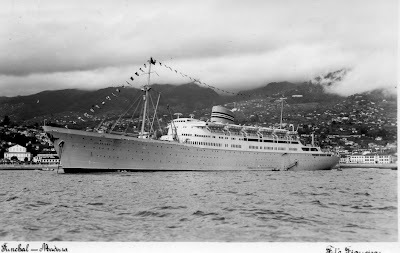 Another view of the Dutch-built motor ship OSLOFJORD of 1949 taken by Foto Figueiras in Funchal, Madeira in the 1950s. 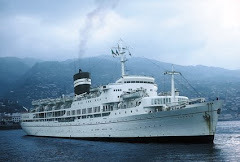 In December 1969 she was chartered with an option to purchase by Costa Armatori, Genova and renamed FULVIA. 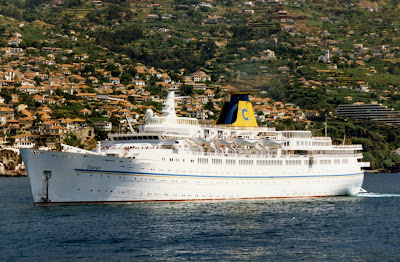 Repainted white with the traditional Costa yellow and blue-green funnel, the FULVIA operated 10-day summer cruises from Genoa to Madeira and the Canary Islands. 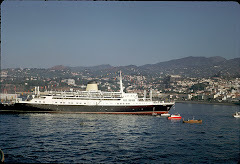 She was lost on one of those cruises on 19 July 1970 while at sea sailing from Funchal to Tenerife. An engine room fire broke out and the ship sunk off Selvagens Islands. Her passengers and crew were rescued by the Paquet flagship ANCERVILLE. 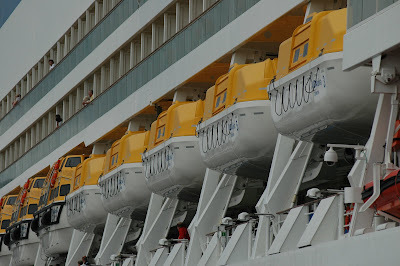 Her lifeboats and tenders were towed to Funchal and spent years ashore at the Eastern end of Pontinha pier. 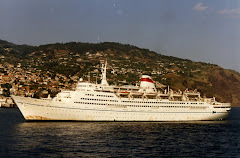 The Norwegian America Line passenger liner and cruise ship OSLOFJORD (1949-1970) was a frequent visitor to Madeira while on cruises. 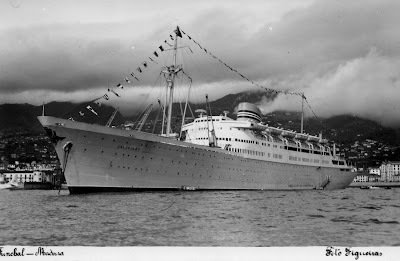 This handsome ship was the early prototype of today's SAGA CRUISES near sisters SAGA ROSE (ex-SAGAFJORD) and SAGA RUBY (ex-VISTAFJORD) as the first of four passenger ships built to the order of NAL after WW2. 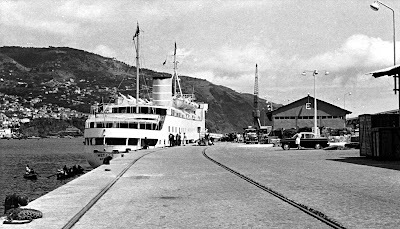 She was followed by the BERGENSFJORD of 1956, and then the SAGAFJORD in 1965 and the VISTAFJORD in 1973. 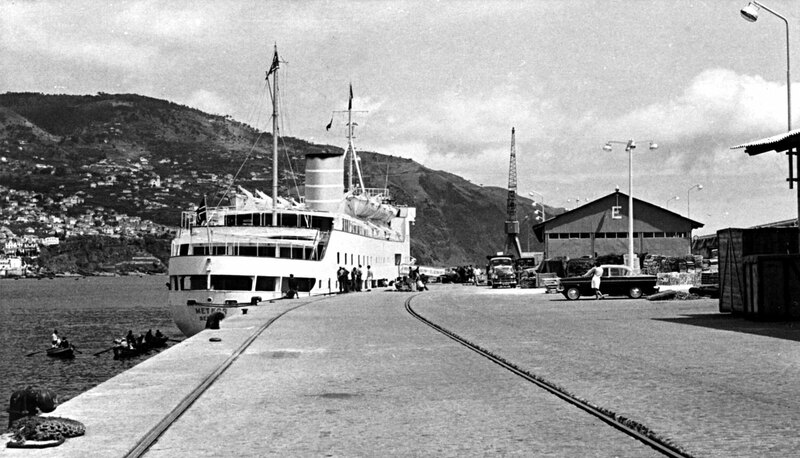 The beautiful motor yacht STELLA POLARIS photographed in the Port of Funchal, Madeira island, while cruising in her original ownership by Bergenske, the famous Bergen Line. 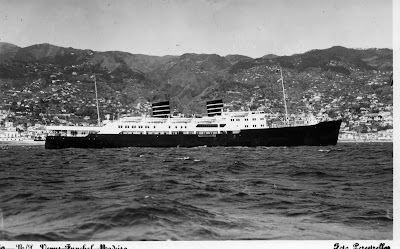 Purpose built in Sweden in 1927, the STELLA POLARIS was designed in the same style as her older fleet mate METEOR built in 1904 for HAPAG and sold to the Norwegians after WW1. Another Dixon post card with the reference NO. MDR.36. The caption on the rear of the card reads "M.S. 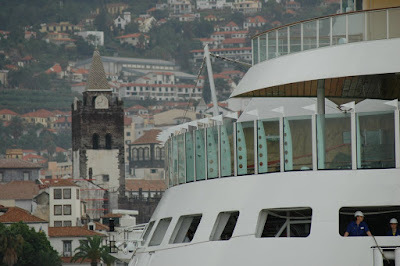 "Venus" in Port, Funchal, Madeira. Natural Colour Photograph. VENUS can be seen in her best angle with her elegant, well balanced profile. 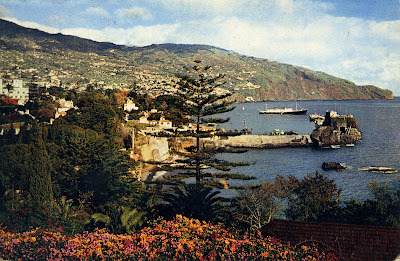 Some of the best post cards ever published in Madeira were produced by J. Arthur Dixon in the 1950s and 1960s, including five post cards of ships. In this card, with reference MDR 21, the Bergen Line m.s. VENUS can be seen clearly at anchor dressed overall. Another view of the VENUS in Madeira. Photograph published by Foto Perestrellos. 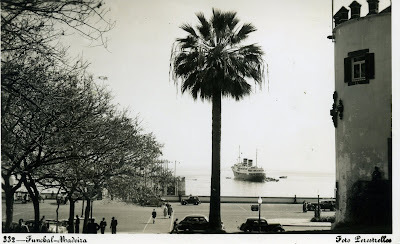 In the fifties and sixties Foto Perestrellos had its office at Avenida Arriaga and those post card size photographs were always printed and available for purchase. As a boy I did buy many photos at PTE 1$50, the equivalent of €0,75. Over the years the cost of those post cards increased and in later years photos were no longer available in print for immediate delivery. We had to select the required images from an album. Photos turned more expensive while quality decreased a little. 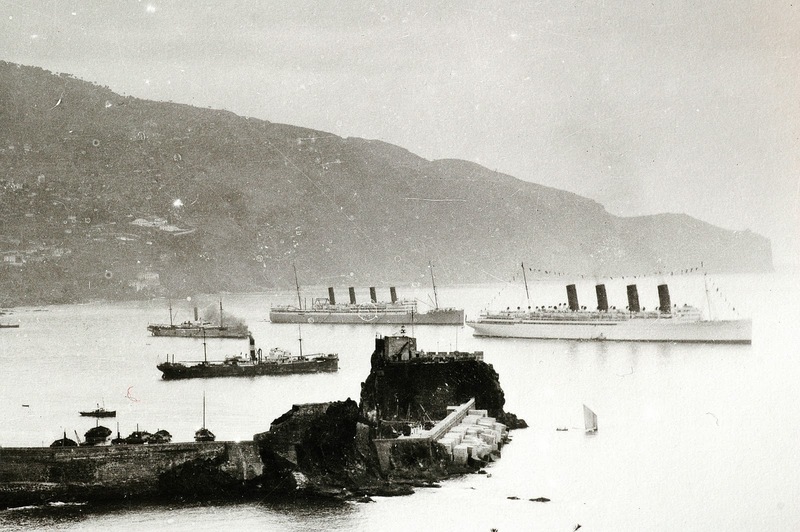 The famous Bergen Line passenger liner and cruise ship VENUS at anchor in Madeira. 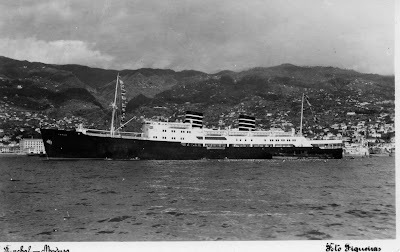 VENUS was of the utmost importance for the development of regular cruising to Madeira after WW2. 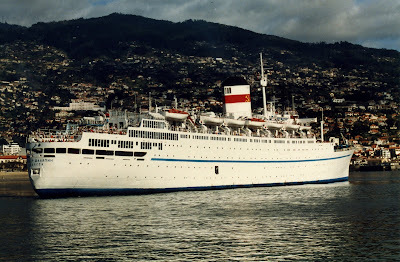 From 1947 up to 1968 the VENUS cruised extensively between Southampton or Plymouth to Funchal, Madeira on off North Sea season weekly cruises bringing hundreds of tourist to the island. 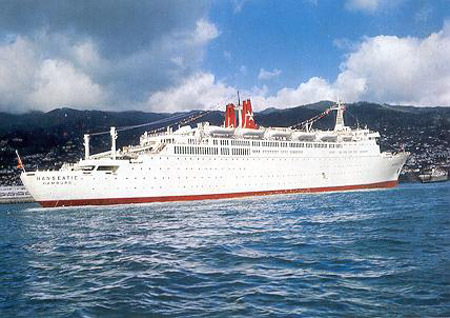 Most passengers traveled on a cruise and stay basis and were transferred by tender directly from the ship at anchor to the Reid's Hotel. When she was withdrawn and sold for scrap in 1968 the service was continued by Fred. 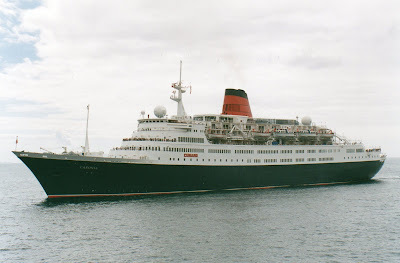 Olsen Lines with the then new BLACK WATCH and BLACK PRINCE sisters also on a seasonal service operated between September and early May until 1986. 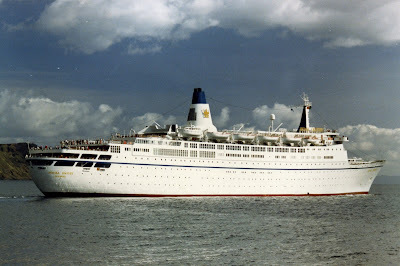 A third ship, the BLENHEIM, was introduced in 1970. 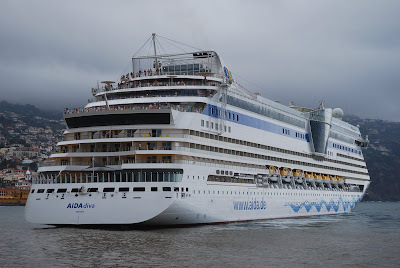 The AIDAdiva in Funchal 2007-11-19.